Nothobranchius capriviensis, new species; male of the Salambala NA 07-1 population from the Salambala Conservency, Zambezi Region, Namibia. Photograph by Brian Watters © 2015. The newly described Caprivi Killifish, Nothobranchius capriviensis, is an iridescent species–electrifying when in full courtship mode–that is already known to killi fanciers but had previously been considered a variant of the Kafue Killifish, Nothobranchius kafuensis. Both annual killifishes are endemic in Namibia, East Africa in the Upper Zambezi River system. 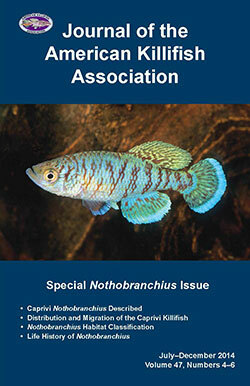 In a Special Notobranchius Issue of the Journal of the American Killifish Association (JAKA), the new species is described, along with an illustrated discussion of the environmental concerns for the future of this and other related species in the same region. 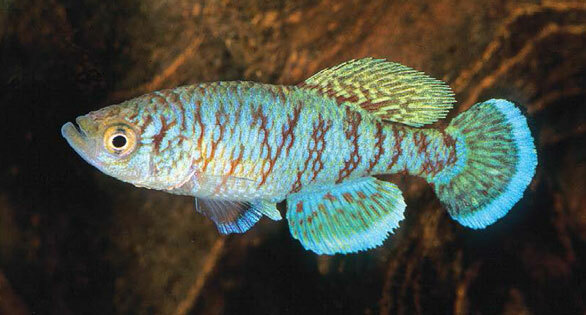 The Caprivi Killifish, according to the authors, is in the category of “Near Threatened” under the IUCN Red List classification. It lives what seems to be a rather precarious life, having to survive the natural rhythms of flooding and seasonal isolation stranded in evaporating pools. They report that some local roadway improvements have helped move some populations out of harm’s way (see downloadble JAKA paper link below). Killifish keepers who have experience with the species say that it is not a beginner’s fish but is neither too difficult to maintain nor to breed. Killi Data Online: Nothobranchius capriviensis [Watters, Wildekamp & Shidlovskiy, 2015]. Posted September, 2015. JAKA Special Notho Issue, released September, 2015. Red List Criteria B2ab(iii). Five other killifish in Zambezi Region are illustrated here. It has created an exceptional stir both among would-be breeders and conservationists, who believe it may be under extinction pressure because of development in Namibia that threatens it.